Caravan with Bruno Liljefors, 1995 is a site-specific installation in Osterbybruk based on Bruno Liljefors painting Jays painted in 1886 (the painting is part of the collection at the National Museum in Stockholm). 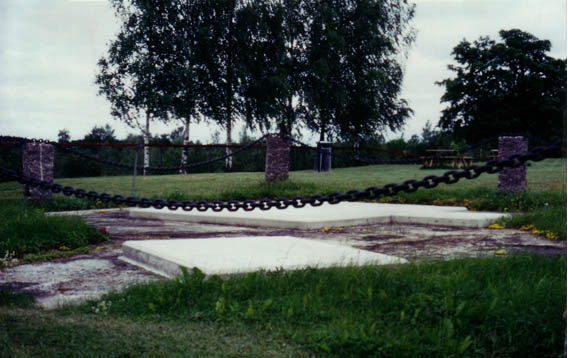 The assignment was to make a site-specific art installation in the Dannemora mine area with the theme ”Young Champions in the Tracks of Bruno Liljefors” from June to August 1995. 20 Swedish artists were invited. My contribution: I chose to move into an abandoned caravan that I found at the dump on the area around the closed mine. A guest worker dumped his mobile vanhome. The mine was closed down in the 80s. Bruno Liljefors farm Österby Bruk is located in this neighborhood and the woods and wild animals in the woods are his artistic motive area. I moved into the caravan which I decorated with screenprinted fabric ”Bruno Liljefors caravan”, after having designed a pattern where I fitted myself with the caravan into the painting: ”pragmatic natural romanticism”. I moved into Liljefors painting, printed textiles of me in the painting, decorated the van and moved into the van and then travelled around in real life before performing imagined travels in the world and in other dimensions. The painting Jays (Nötskrikor) represent the birds and the forest districts around Osterbybruk / Dannemora. After some weeks of travels and life in the van it was placed on a concrete foundation covering the mine’s opening, hundreds of meters deep. A glorious pedestal. The Van transfered into a sculpture raised on its pedestal, surrounded by a rough chain, like royalistic monuments on horseback placed on squares of large cities. The Caravan sculpture was open for visitors. Every day for the rest of the summar I sent a new computer-manipulated postcard from fictitious caravan travels around the world and in the history of art, addressed to the caravan and the visitors.